To help students submit the best possible video, we put together this list of the top reasons that videos were disqualified or lost points last year. This list is not a substitute for reviewing and following the Contest Rules. Problem: Music choice disqualified some entries. 1. Ensure music is royalty free, is not copyrighted, and is okay to use on commercial projects. Visit our Tips for Creating Videos web page to find sources for royalty free music. Example: Don’t use popular music unless you can submit proof that you have the artist’s permission. Example: Don’t download music from YouTube videos. 2. Ensure that you cite all music sources on your Reference Sheet. 3. Review the video requirements in the Contest Rules. Problem: Unoriginal images and video footage disqualified some entries. 1. Ensure images are royalty free, are not copyrighted and are okay to use on commercial projects. Visit our Tips for Creating Videos web page to find sources for royalty free images. Example: Microsoft clip art cannot be used for commercial projects. Example: Pictures from news websites, blogs, government agencies, and other sites are often copyrighted. 2. Cite all unoriginal images or video on your Reference Sheet. Problem: Facts, statistics, and other information were incorrect or could not be verified. 1. Use only TakeCareOfTexas.org to select and research a topic. 2. Cite all information sources on your Reference Sheet, as you would for a class paper. Google is not a source. 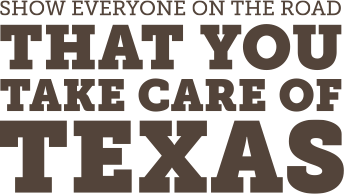 Problem: Some videos were disqualified for issues with the Take Care of Texas slogan or logo. 1. Use the logo provided on the Tips for Creating Videos web page. 3. Pronounce the slogan correctly. 4. Review the video requirements in the Contest Rules. Problem: Some videos lost points because of grammatical and spelling errors. 1. Review your script and video for errors. 2. Use a spell and grammar check. 3. Have a friend, teacher, or family member review your video. Better yet, have more than one person review your video. Problem: Some videos were disqualified because they were not the right length. 1. Plan ahead. Give yourself extra time to handle unexpected situations like this. 2. Create a script and read it aloud while timing yourself. Do this several times. 3. Edit the video to the correct length.